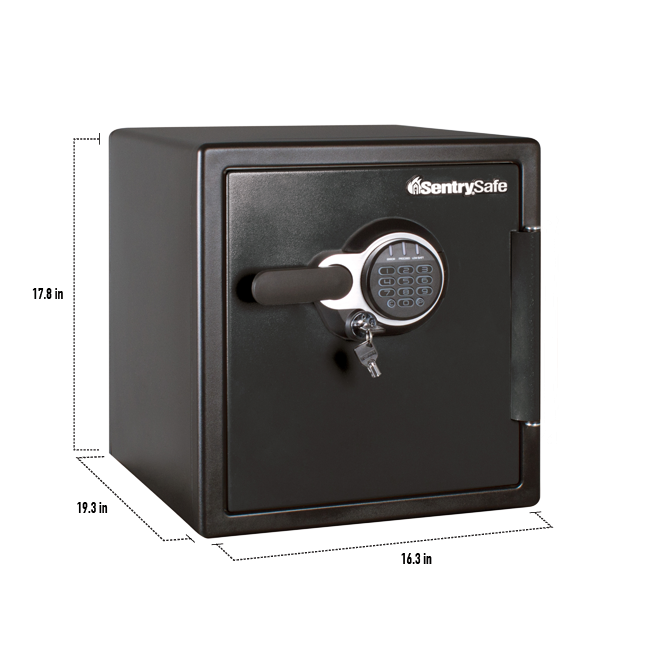 SFW123GSC Digital Fire/Water Safe is rated 4.8 out of 5 by 15. 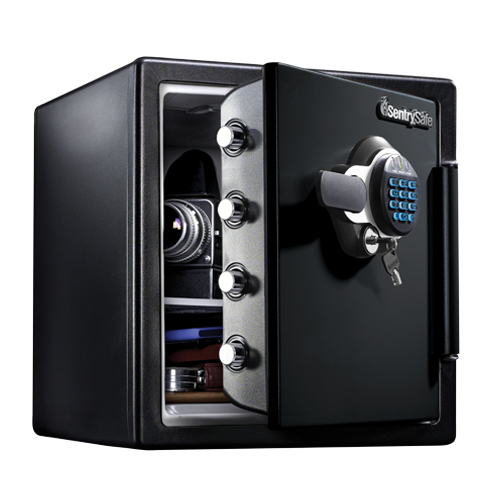 The SentrySafe SFW123GSC is designed to protect documents, digital media and other valuables from fire, water, and theft. 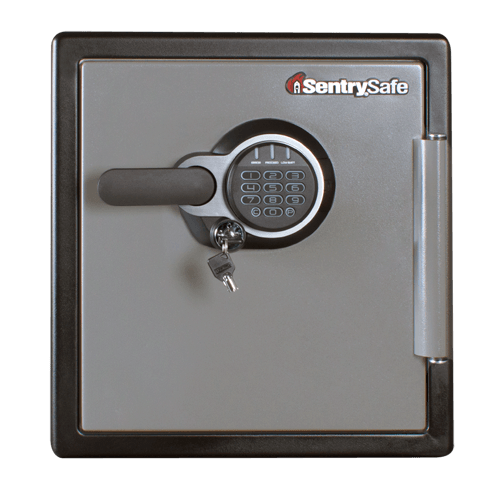 Bolt down hardware and a pry-resistant hinge bar offers additional security against unauthorized access. Rated 5 out of 5 by Bill P from SFW123GSC Digital Fire/Water Safe Looks to be a solid safe which I intended to buy. Apparently I did not do enough research on safes. 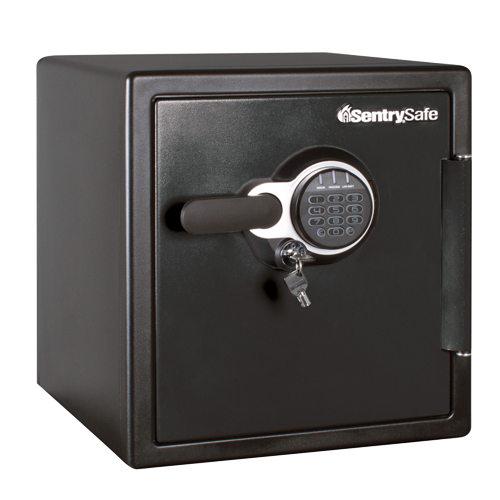 I was thinking this safe could be opened using EITHER the code OR the key. The key is meant for ADDED security. Still very happy with the safe. Since I am new to electronic safes, just curious what happens should the electronic part ever fail. Rated 5 out of 5 by Bill Cody from It worked! This safe went through the Paradise Calif. fire that destroyed my home. The keyboard was destroyed. A torch was used to gain entry. Everything in the safe was 100% okay. Some of the items were Money, passports, marriage license, birth certificates, remote automobile keys, plus much more. All were 100% okay. THANK YOU SentrySafe. Rated 5 out of 5 by Polly76 from Looks like it's well built! It should have four bolts to secure it to the floor and it should be noted in the instructions, the mark on the bottom of the front foot pad is offset so the bolt head doesn't interfear with the door closing. Rated 5 out of 5 by ScottB from Exactly what we needed We were looking for a small fire safe to store some original old product design drawings and this fit the bill perfectly. Part of why we picked this one is the size. It fits where we want to keep it. Rated 5 out of 5 by TimM from Ideal safe This safe is just the right size to meet my needs and keep my important things safe and secure. Thank you for making such a great safe! Rated 4 out of 5 by HAHS from Grreat Safe and Easy to Program Straight forward and easy to program. You will need to buy batteries before being able to use the electronic lock though. Rated 4 out of 5 by Mike16 from Strong and hope fire proof if needed Looks like decent quality and hope not to find out how long it lasts in a fire good for important papers etc.